U.S. issues visa to new N. Korean ambassador to U.N. after 4 months. September. 13, 2018 07:51. by Yong Park parky@donga.com. The United States recently issued a visa to North Korea’s next Permanent Representative to the United Nations Kim Song after dragging its feet for four years, multiple sources said Tuesday (local time). The visa would allow the North Korean U.N. mission to fill the vacancy of its ambassador that continued for over a month and join the 73rd U.N. General Assembly meeting to open on September 18. Multiple U.N. sources said Tuesday that the U.S. Department of State has recently issued a visa to Kim, allowing him to take the top post at the North Korean U.N. mission before the upcoming U.N. General Assembly meeting. The post of North Korea’s ambassador to the U.N. has been vacant since Ja Song Nam, the previous representative, returned to Pyongyang on July 25. 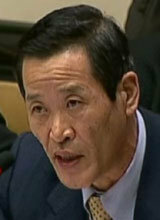 Kim In Ryong, the deputy ambassador to the U.N., has been serving as the chargé d'affaires. Washington’s visa issuance is seen as a signal indicating progress in the North Korea-U.S. relations following the cancellation of U.S. Secretary of State Mike Pompeo’s visit in late August to Pyongyang. “Kim apparently applied for his visa in late May through the U.S. Embassy in Beijing, but has received no indication of when the process will be completed and is unable to travel to the country in the meantime,” Japan’s Kyodo News Agency reported last month, viewing the delay as U.S. pressure on North Korea amid a stalemate in bilateral talks on denuclearizing the North.